Everyone knows the story of the Prodigal son, right? Oh, and there’s a little bit about his brother, and jealousy. But – this is all about God’s love for us, and how we can just run off, do what we want, and come back, and he’ll be thrilled to have us home, right? Let’s have a quick look at the other brother. What happens with him? He sees his rash, younger brother ask for all his inheritance, and then run off into the world, with all the wisdom of an 18-year-old college student on a bender. The older brother, on the other hand, stays home, continues to work for his father, knowing full well that he is earning every last penny of his inheritance, and not running around like a little whelp. But then his brother returns! And with it, there is much celebrating and fanfare. And it’s not fair. He’s been loyal this whole time, with hardly ever a young goat to celebrate with, yet his father kills the best possible entree for his wretched brother? He’s expecting wrath. 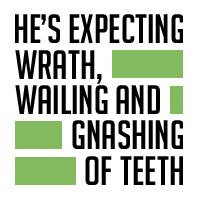 He’s expecting a tirade from his father upon his brother – wailing and gnashing of teeth. Instead, he sees grace. He doesn’t know his father. He’s expecting the gift of his inheritance will come from his good works, and not from the grace and love of his Father. And when he sees his brother sinning, and filthy, and stinking of pigs, and yet, still celebrated and welcomed home, he grows resentful.